A little over a third of the refugees who were admitted into the United States in fiscal 2016 (37%) were religious minorities in their home countries. Of those, 61% were Christians, according to a Pew Research Center analysis of data from the State Department’s Refugee Processing Center. 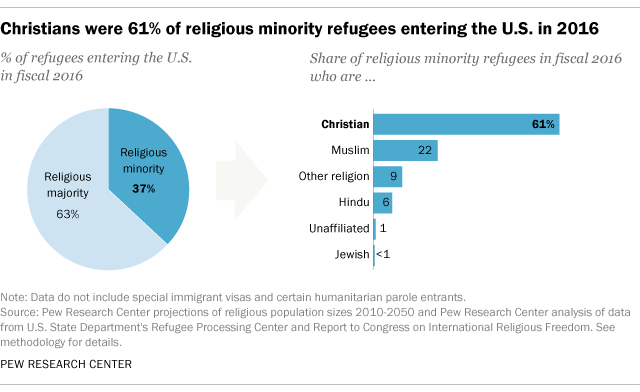 Muslims, the next largest group, made up 22% of the religious minority refugees who were admitted to the U.S. Other, smaller world religions and Hindus made up the bulk of the remaining religious minority refugees (9% and 6%, respectively). The analysis comes as Donald Trump’s administration has announced it will give priority to religious minorities who apply for refugee status in the U.S. Trump himself has said that Christians will be given preference. The landscape is different when it comes to the two-thirds of refugees who entered the U.S. as religious majorities in fiscal 2016. Six-in-ten of these refugees (60%) were Muslim and 35% were Christian. Buddhists made up 6% of these refugees, coming mostly from Burma (Myanmar) and Bhutan. The U.S. admitted 85,000 refugees in 2016. Almost all came from these 10 countries: the Democratic Republic of Congo (19%), Syria (15%), Burma (15%), Iraq (12%), Somalia (11%), Bhutan (7%), Iran (4%), Afghanistan (3%), Ukraine (3%) and Eritrea (2%). Christians are a religious majority in three of these 10 countries. For example, the Democratic Republic of Congo – from which the U.S. accepted the largest number of refugees (over 16,000) in 2016 – is a predominantly Christian nation, split almost evenly between Roman Catholic and Protestant Christians. The vast majority (93%) of refugees accepted from that country were of these Christian denominations. Similarly, 61% of refugees coming to the U.S. from Eritrea in 2016 were Orthodox Christians, the majority religious group. Christians are also not the only religious minority group in Muslim-majority countries. This is partly because many of the Muslim-majority countries from which the U.S. received the most refugees in 2016 – Syria, Iraq, Iran, Afghanistan and Somalia – are nations where various sects of Islam are considered religious minorities as well. In Syria, for example, non-Sunni Muslim groups (including Shia Muslims, Alawites and Ismailis) are religious minorities. In Somalia, Shia Muslims are estimated to be less than 1% of the population and thus are also considered minorities. Note: Data for estimations of countries’ religious group sizes came from the State Department’s Report to Congress on International Religious Freedom in 2015. For detailed methodology, see here (PDF). Since travel order lifted, more than 1,800 refugees from affected countries have entered U.S.